Iris Reticulata and Iris Histrioides are a dwarf wild iris species that bloom in the spring season. The bulbs of Iris Reticulata are characterised by net-like skin or protective covering and is also known as netted irises. This bulbous perennial is native to the Caucasus, Iraq, northern Iran and Turkey. These plants are well suited for woodlands, rock gardens creating borders or for lawn art. Blooms appear in September and continue flowering till October in Australia. Flowers are striking purple with yellow and white accent colours. The size of the flower comes to 2.5 inches in diameter. The flowers are slightly fragrant and the leaves are similar to that of grass. 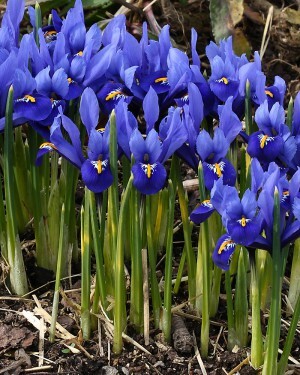 This variety of dwarf iris bulbs, go dormant in late spring before the vintage lemon daylilies begin to flower. This plant makes excellent cut flowers and can be used in wedding bouquets. It is easy to grow in any type of soil. The plant grows to a height of 0.25 to 0.50 feet. These are ideal plants for containers and pots. The plant spreads to other areas over time by forming offsets. You can plant Iris Reticulata in areas with full sun or partial shade. They need alkaline well-drained ground or soil to grow. When planting, remember to use bulb fertiliser to ensure perfect growth and flowering. These plants are drought tolerant and require no watering during the long summer period, keep the soil moist and not waterlogged during the growing season. Erratic flowering has seen in the first two years after planting. Once the plant gets established, the plant produces flowers regularly. You need to space the bulbs at least 3 inches apart when planting in garden beds, less when planting the bulbs in a garden pot. Water well, after planting the bulbs. Keeping the soil dry in summer, helps in setting the buds in the following year. Caring for the Iris reticulata, netted iris plant is very low maintenance. The netted iris patch needs rejuvenation every 2 years so that the soil stays rich. Dividing and replanting the offsets after blooming ensures that your patch will have a good display of flowers. When planting the bulbs, make sure that the roots are down in the soil and the spike is pointing up. After the flowers die down allow the leaves to die back. This will help the plant to store the nutrients till the foliage is green. Make sure that you use a bulb fertiliser or blood and bone to feed the plant after blooming is completed. The seed propagation for Iris Reticulata and Iris Histrioides bulbs is not very easy. For seed propagation, you need to collect the seeds and sow them in seed raising mix, soil that is sterile. The temperature should be less than 50 degrees. You can also place the seeds in cold frame to allow the germination in spring. Propagation is also done by the division of clumps. Select large clumps of either Iris Reticulata or Iris Histriodes bulbs and divide them carefully into smaller clusters with a handful of bulbs. This should be done during spring when the flowers are dying down and the foliage is still vigorously green. Planting single bulbs will take more time for the plant to become established. Iris Histroides Katherine Hodgkin, I.H. Lady Beatrix Stanley, Iris Histroides George. All these varieties have blue and purple shades. Iris Danfordiae is a bright yellow variety and can all add colour to your garden.